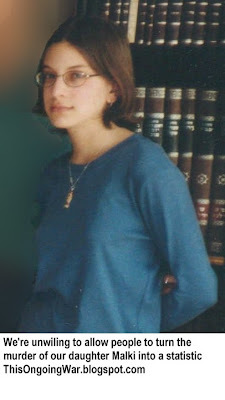 Jordana Miller of Jewish News One, a new global non-profit international news network that was launched on 21 September 2011, interviewed the Roths in their Jerusalem home a day before the Gilad-Shalit-for-terrorists hand-over of hundreds of convicted murderers. The video clip below is one of the few that we have seen that gave us the opportunity to deliver more than the briefest of sound-bites to a video audience. Click to view the interview which is currently hosted on YouTube. The petition mentioned in the interview - to have the name of our daughter's murderer removed from the list of terrorists to be freed - is here. 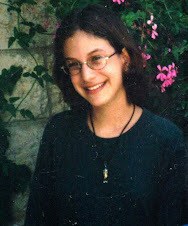 We failed in our effort, and that murderer was released from her Israeli prison cell last week. She is currently living in "exile" in Jordan (where she was born and where an unknown number of members of her family live) where she is being feted and honored as a hero and as a figure worthy of emulation, especially by children and women. But it was not just we who failed. And it will certainly not be just we who pay the terrible price of that failure.